Burnt copies of the Bible lying outside the prayer home at Sikkandar Chavadi in Madurai. “A prayer home of a Pentecostal church in Sikkandar Chavadi here was vandalised and copies of the Bible were burnt, allegedly by members of a Hindu right wing group on Sunday. Some members, reportedly of the same group, later went to three other prayer homes belonging to Pentecostal church in nearby areas and verbally abused the pastors and worshippers and threatened to attack the homes if they were not shut in a week. M. Ravi Jacob, the pastor at the Sikkandar Chavadi prayer home, which is a branch of Rhema Church, said more than 10 people, including a person who had an armed policeman as his Personal Security Officer (PSO), came to the prayer home in the morning. “I, my wife, two children and a few others who had come for the prayer were there. The men used abusive language and roughed up me and my wife,” he said. He alleged that they later took out copies of the Bible present at the home, along with his mobile phone and a few other belongings, and burnt them in the street. Corroborating his allegations, the family who owned the place, which is a small tile-roofed structure in a narrow lane, said the pastor had rented the place a couple of months ago and visited it on Sundays for prayer meetings. Jerome Jegatheesan, pastor of ‘Bethesda Varthaiyin Jeba Veedu’ prayer home in Koodal Pudur, said a group of people visited the home a couple of hours after the incident at Sikkandar Chavadi. “They abused us in filthy language and asked us to stop our activities,” he said. 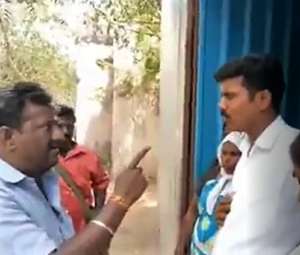 Hindu Munnani leader threatening pastor Jerome Jegadeesan in front of his church in Koodal Puthur in Madurai. Sasi Sugathiya, a pastor with Living God Church, said two other prayer homes in Koodal Puthur area were also threatened on Sunday. The video of the group threatening one of the prayer homes was uploaded on Facebook by a person claiming to be a Hindu Munnani member. N. Manivannan, Madurai Superintendent of Police, said a case had been registered based on Ravi Jacob’s complaint against 10 unidentified Hindu Munnani cadre. “We have identified three persons involved in the incident. However, we are yet to arrest any of them,” he said. On the presence of a PSO, he said the police were yet to confirm that. “If a PSO was present, it will make the identification of the accused easy,” he added.